Make space for Date, Big Love, Hippy, Hunnie & Swanky Bingo! Lord Bingo News Bingo Promotions Make a Date with Big Love, Hippy, Hunnie & Swanky Bingo! Make a Date with Big Love, Hippy, Hunnie & Swanky Bingo! Hot off the press! It seems Bingo sites are like buses…none for a while and then four awesome sites come at once to join the Live Bingo Network! So clear your schedules and make space for Date Bingo, Big Love Bingo, Hippy Bingo and Swanky Bingo! 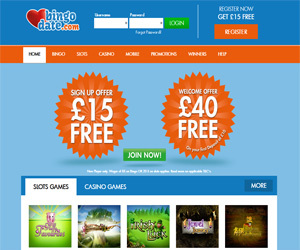 The latest bingo site to romance the reels and launch for 2016 is Date Bingo! You can get swept off your feet with a FREE £15 no deposit required welcome bonus, which you can use for a Free bingo! Next, if you give just £10, you’ll be spoilt 400% first deposit bonus to find your rich match with £40 extra! The site will also indulge you with loving cashback, bonus and promotional treats! You can then get your heart racing with bingo, slot, casino and progressive games, to help you uncover romantic jackpot riches! We’ve finally found what you’ve always been looking for, Big Love Bingo! This might just be the real deal and the site is set to grace the reels with love for 2016! We can only assume Big Love Bingo will welcome you with open arms with a generous welcome bonus, loving promotions, heart-racing bingo, slot and casino adventures, and lead you to love-struck fortunes! From what we can guess, you’ll be able to find happy, peaceful psychedelic fortunes at Hippy Bingo! We’re thinking the happy reels will be filled with daisy’s, caravan, peace, and free love. Expect a groovy welcome bonus, happy-chic promotions, and free-spirited bingo, slot, casino and jackpot tournaments, to find inner-peace and happy riches! Hunnie Bingo is set to launch for 2016, and this may just be the latest sweet as honey, love bug, site to grace the reels! Hunnie is usually used as a term of affection, so we're thinking endearing animations, sweet bonuses and sugary promotions. We're sure you'll be won over at reels by adrenaline-racing bingo, juicy slot and casino games, and sugar-fixing jackpot fortunes! The word on the street is that the new site Swanky Bingo will soon be ready to swagger onto the scene for 2016! The luxury reels are sure to be filled with fancy animations, flashy welcome bonuses and high-rolling promotions. If this site is anything like the other sites on the Live Bingo network, you'll be in for a rich slot, casino, and jackpot treat! Stay tuned for all the upcoming juicy details!